London Heathrow Airport is located 24Km West of the centre of London, close to the M4 motorway and with good rail links into the city. Heathrow has 5 terminals, the 5th being completed in spring 2008. 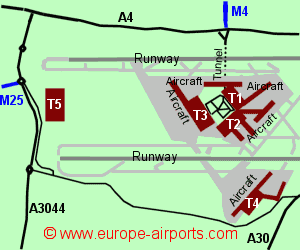 Terminals 1,2 and 3 are located in the centre of the airport, approached via a tunnel from the north. Terminal 4 is on the south side of the airport and terminal 5 at the western end. Terminal 2 has undergone extensive rebuilding work and re-opened in 2014, now named the Queens Terminal. Terminal 1 closed in 2015 and is due to be demolished to make way for extensions to Terminal 2. 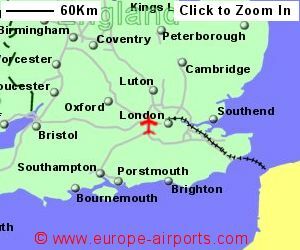 The airport is approximately 1km inside the M25 ring road (with a link going to terminal 5) and 2 Km south of the M4 (with a link going to the terminal 1,2,& 3 tunnel. The Heathrow Express non-stop train has a 15 minute journey time into the city from Heathrow central for terminals 1 and 3. Terminal 5 also has it's own station and there is a free transfer from Heathrow central to terminal 4. The Heathrow Connect is a stopping train between Heathrow Central and city. Heathrow airport is also served by the Underground (Tube) Piccidilly line, with stations at Heathrow Central, Terminal 4 and Terminal 5. A number of bus routes provide transport to and from the airport including National Express to destinations including the other London airports, Reading, Oxford, Woking, Northampton, Norwich, Ipswich, Colchester and Braintree. National Express also offer a Hotel Hoppa to local hotels for 4 pounds one way. Short and long term parking is available at various locations within the airport and a number of local hotels offer parking and shuttle buses into the airport. 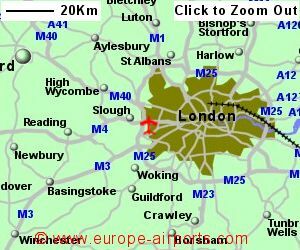 Within the 5 terminals at Heathrow airport there are approximately 50 bars/restaurants and a large number of shops. Free unlimited WiFi Internet access is available. There is also a faster paid for service. Heathrow airport has Airport Carbon Accreditation, at the Optimisation level. London Heathrow is Europes busiest airport for passenger numbers, handling more international passengers than any other in the world. Heathrow airport catered for nearly 78 million passengers in 2017, a 3% increase from the previous year, and the busiest year yet. The airport is running virtually at full capacity, and although there have been plans to build a third runway, this was stopped by the government in 2010 but then approved in 2016.